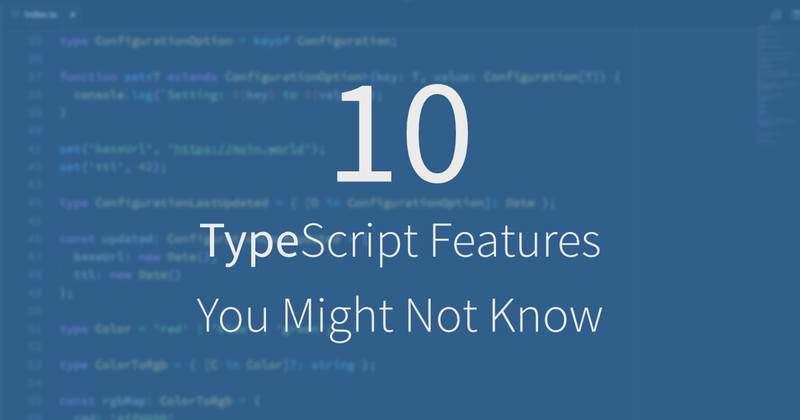 10 TypeScript Features You Might Not Know · Moin World! Recently TypeScript is increasingly gaining popularity and companies like Slack are praising their move to TypeScript. But with TypeScript shipping monthly updates to the language and its tools even a regular TypeScript developer might lose track of what is being added. TypeScript will automatically create a tsconfig.json in your directory. The neat thing is that it automatically populates it will all available options (some of them commented out) and a description of the respective option. This is especially useful if you are new to TypeScript and want to get an overview of all options. Have you found yourself in the situation where you needed two separate tsconfig.json files for example for tests but most of the options were shared? With the extends option we can specify a configuration file that we want to base our current file on. Addtionally you will be able to redefine an interface multiple times which means you will be able to add addtional parameters at different parts in your code. set('baseUrl', true); // Invalid! Compiler catches this. Now we have a function that will not only check that we are passing in a valid value for key but also that the type of value is the right one for the respective option. Now that we know about the power of keyof let me show you one more awesome thing related to this. This is not limited to types generated with keyof though. Object has been around as a type for quite a while but in 2.2 TypeScript introduced a new type object. The difference in spelling is minimal but they represent completely different groups of objects. Object is basically anything that is not undefined or null. On the contrary object represents anything that isn’t a primitive type (string, number, boolean, etc.) plus undefined. The reason why this type exists is that there is a set of functions like Object.create that get an object as argument. With the introduction of object as a type we can now properly type these function calls and catch mistakes early. If you are a fan of async/await but were bummed out that you had to support ES5 or even ES3 as your target, you will love this. TypeScript is able to transpile async/await to both ES5 and ES3 as long as you have a Promise polyfill. In this case myFavoriteColor will be of the value '#00ff00' during runtime and it has the type of Color.Green since it’s a constant. For the chosenColor, TypeScript will automatically walk one step up and assign it the type Color since it could change over time. The value assignned during runtime will be '#ff0000' as expected. In this case we specify a numeric value for ErrorCodes.NotFound of 404 and because ErrorCodes.MethodNotAllowed follows in the listing, it will automatically be assigned 405. ErrorCodes.Unknown, however, is assigned to a string value of 'unknown'. This is only possible due to the strict enforcing of having an initializer for string values. Similarly you can disable it on selected files using // @ts-nocheck of for a specific line by adding above the line // @ts-ignore. These features also work in combination with the respective editor integrations like in VS Code. It’s super useful if you want to move your code base over to TypeScript but you can’t change the actual files to TypeScript yet for whatever reason. This is just a small overview of a few features that are currently in TypeScript (or are coming this month) that I’m excited about. But there is much more planned, including Variadic types, ambient decorators (decorators that are only there during compile time) but don’t affect runtime and much more. A great overview of what’s planned is the Roadmap in the TypeScript wiki. I would love to hear what your experience with TypeScript is, why you do or do not like it and what your favorite TypeScript feature is. Simply shoot me a message on Twitter @dkundel. © 2017 - 2018 Dominik Kundel. Powered by Hexo. Theme based on Apollo Theme.